The party preparations are in full swing with my return gifts all ready, most of the shopping done, all craft projects completed and cooking preps underway. I couldn’t post things as they were done, but well… finally I sneaked out a little time to share this short post. These were decorated last week Have a look! Liked them? Though they are fairly easy and self-explanatory, still.. here is a quick tutorial/tips on how to make them. 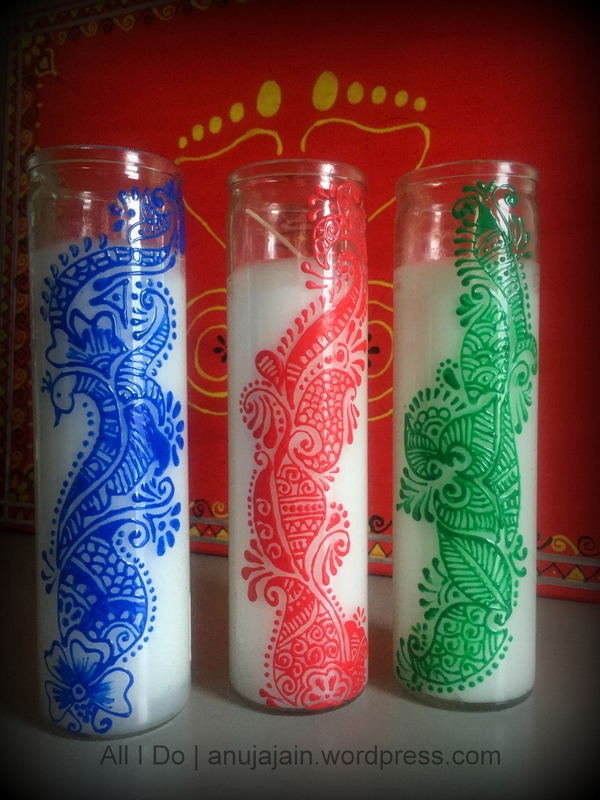 If you don’t know how to create henna patters, feel free to use mine or look up henna patterns on internet and try to copy them on your candle. Make sure your hand movement is fluid and not broken. Keep the nozzle hovering a little above the glass surface, do not touch or drag the nozzle on the surface. This will help keep the lines clear and puffy. I bought five such candles, three are used here, will share rest two with new designs soon. Hope you liked my henna candles. Happy Crafting!